Buy the UN Markings Poster! Important information to help your shipping station emloyees. 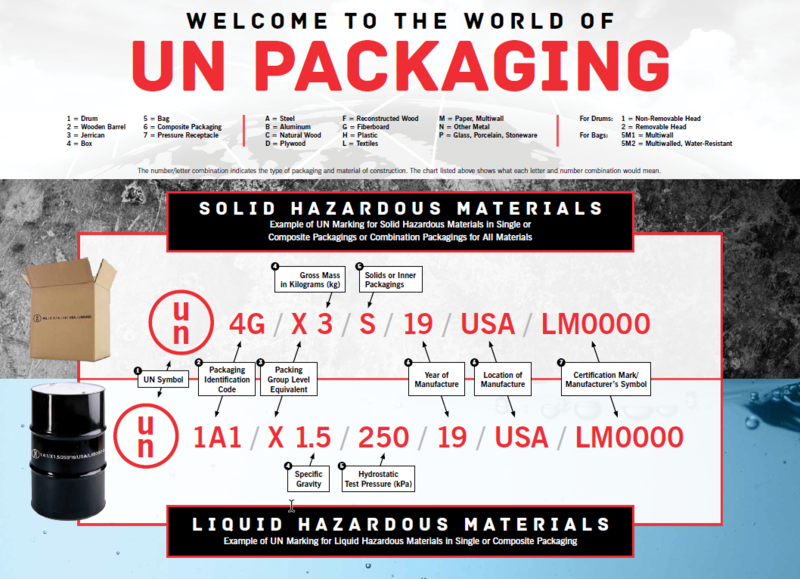 The UN Packaging Guide Poster provides quick reference to UN Packaging requirements for DOT hazmat training. 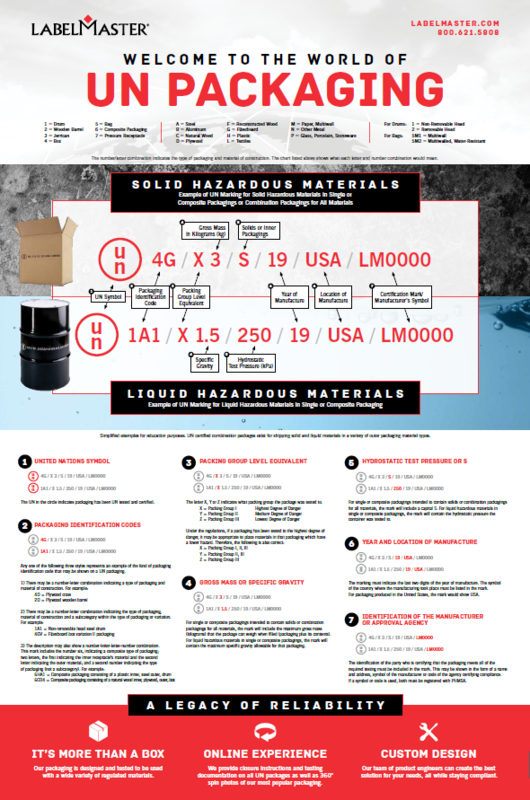 This guide will take the guess work out of shipping and provide DOT hazardous materials training for you and your employees. The poster measures at 27" x 37" and is laminated on both sides. 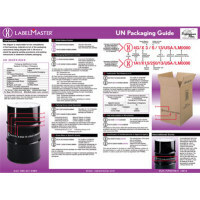 Simplified examples of UN packaging markings in this image are for educational purposes only. 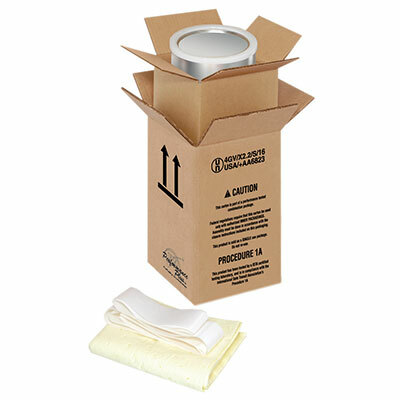 UN certified combination packages exist for shipping solid and liquid materials in a variety of outer packaging material types. The UN in the circle indicates packaging has been UN tested and certified. The UN symbol can either be included with a lowercase "u" over a lowercase "n" in a circle or as an uppercase "UN". Any one of the following three styles represents an example of the kind of packaging identification code that may be shown on a UN packaging. The letter X, Y, or Z indicates what packing group the package was tested to. 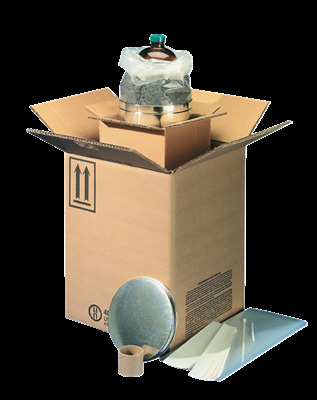 Gross Mass for Solids - For single or composite packagings intended to contain solids or combination packagings for all materials, the mark will include the maximum gross mass (kilograms) that the package can weight when filled (packaging plus its contents). 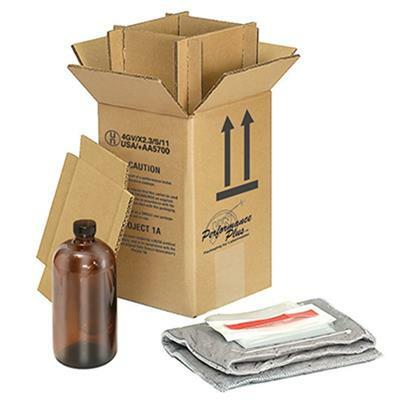 Specific Gravity for Liquids - For liquid hazardous materials in single or composite packagings, the mark will contain the maximum specific gravity allowable for that packaging. 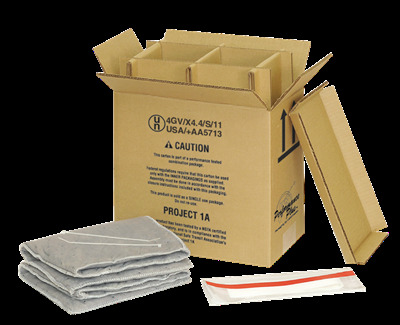 Solids - For single or composite packagings intended to contain solids or combination packagings for all materials, the mark will include a capital "S". 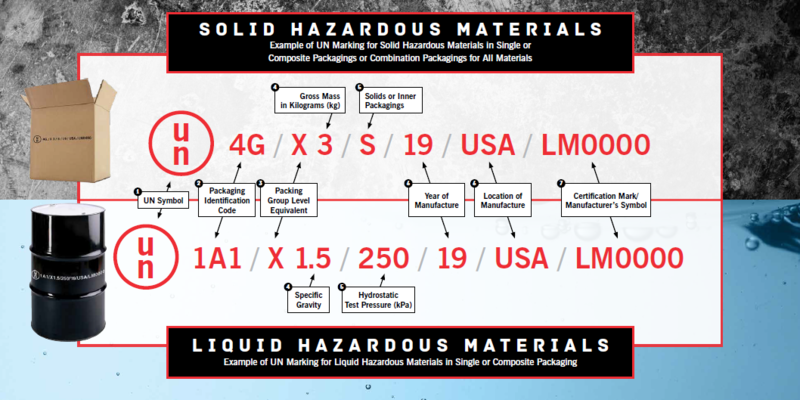 Liquids - For liquid hazardous materials in single or composite packagings, the mark will contain the hydrostatic pressure the container was tested to; the hydrostatic pressure should be included in kPa (kilopascals) rounded down to the nearest 10 kPa. Year of Manufacture - The marking must indicate the last two digits of the year of manufacture. (For example, 16 for 2016). Manufacture Location Country Symbol - The symbol of the country where the manufacturing took place must be listed in the mark. For packaging produced in the United States, the mark would show "USA". The identification of the party who is certifying that the packaging meets all of the required testing must be included in the mark. This may be shown in the form of a name and address, symbol of the manufacturer, or code of the agency certifying compliance. If the symbol or code is used, both must be registered with PHMSA. Click to download the UN Markings Infographic PDF to enlarge.